Wes Davidson, aka "WesIsland," can help you live your dream by moving or investing on the affordable, green side of the Big Island of Hawaii where waterfalls and nature abound. One of my hobbies is reading and one of my favorite authors is Mark Twain. 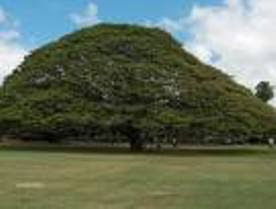 So when I heard that at the age of 31 he had brought the monkey-pod tree to the Big Island, I was immediately curious. The monkey-pod tree is fascinating and magnificent. 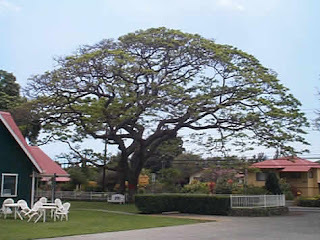 Part of the legume family the tree is also commonly known as raintree, from the belief that the tree produces rain at night. The leaflets close up at night or when under heavy cloud cover, allowing rain to pass easily through the crown. This trait may contribute to the frequently observed fact that grass remains green under the trees in times of drought. But back to Mark Twain – why would he be the one to bring this fantastic species to the Big Island? As far as I know he wasn’t particularly interested in botany, and for another, where would he get the seeds and how likely were they to grow? It sounded like a tall tale to me. Another typical reference, taken from Pahala Village Hawaii History of Ka`u, “1866: Mark Twain visits Ka`u. He plants a row of monkey-pod trees in Waiohinu” (http://www.pahala-hawaii.com ). Yet in Mark Twains’ letters about visiting Waiohinu there is no mention made of a monkey-pod tree planting. Nor did I see it in his book, Roughing It in the Sandwich Islands which is basically his Hawaii letters in more polished form. His letters from the Sandwich Islands (Hawaii) were published in the Sacramento Daily Union. Here is the complete excerpt from his time in Waiohinu. We went ashore in the first boat and landed in the midst of a black, rough, lava solitude, and got horses and started to Waiohinu, six miles distant. The road was good, and our surroundings fast improved. We were soon among green groves and flowers and occasional plains of grass. There are a dozen houses at Waiohinu, and they have got sound roofs, which is well, because the place is tolerably high upon the mountain side and it rains there pretty much all the time. The name means "sparkling water," and refers to a beautiful mountain stream there, but they ought to divide up and let it refer to the rain also. A sugar plantation has been started at Waiohinu, and 150 acres planted, a year ago, but the altitude ranges from 1,800 to 2,500 feet above sea level, and it is thought it will take an other year for the cane to mature. We had an abundance of mangoes, papaias and bananas here, but the pride of the islands, the most delicious fruit known to men, cherimoya, was not in season. It has a soft pulp, like a pawpaw, and is eaten with a spoon. The papaia looks like a small squash, and tastes like a pawpaw. In this rainy spot trees and flowers flourish luxuriantly, and three of those trees - two mangoes and an orange - will live in my memory as the greenest, freshest and most beautiful I ever saw - and withal, the stateliest and most graceful. One of those mangoes stood in the middle of a large grassy yard, lord of the domain and incorruptible sentinel against the sunshine. When one passed within the compass of its broad arms and its impenetrable foliage he was safe from the pitiless glare of the sun - the protecting shade fell everywhere like a somber darkness. And no mention of planting a row of monkey-pod trees or even of planting a single one! On the other hand, I did learn that the monkey-pod tree was reportedly introduced into Hawaii in 1847 almost 20 years before Mark Twain arrived. Mr. Peter A. Brinsmade, a businessman visiting Europe, returned to Hawaii, presumably via Panama, with two seeds, both of which germinated. One of the seedlings was planted in downtown Honolulu, the other at Koloa on the island of Kauai. (These seedlings are possibly the progenitors of all the monkey-pod trees now in Hawaii). And further, although the seeds are hard coated and long lived, some germinate soon after moistening by soil contact. 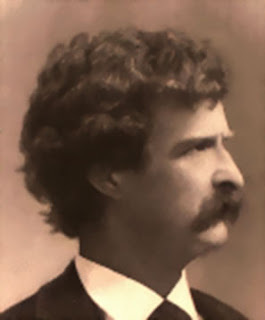 Mark Twain did spend two months in Ho no lulu, Waikīkī and Nu‘u anu, and five weeks on Maui before coming to the Big Island. -- so it was possible that he brought the seeds from Oahu. He spent three weeks here after landing at Kona and traveling along the south coast and up to Hilo and to the volcano at Kīlauea. So, I say, if that’s their claim to fame, let the legend live on! I’m sure Mark Twain would support it. And, if not true, it should be because it sounds just like the kind of tree and tale he would have loved. p.s. why do I have to choose a profile to post a comment? I have a google email account, but never use it. Click on the picture to go to Lava Pix.com where you can purchase images by this award winning photographer whose photos have also appeared in National Geographic. 20% of sales profits go to Easter Seals Hawaii on the Big Island. Hawaii Real Estate? Click the Pic! I represent Clark Realty Corporation. I can help you find or sell your piece of paradise.